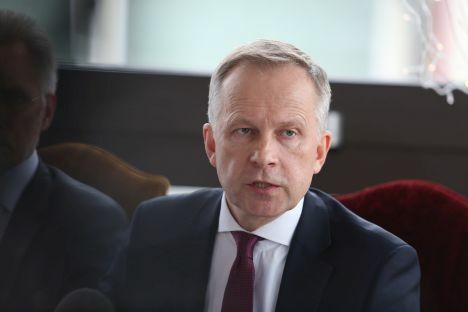 After the ruling of the European Union’s Court of Justice, which allowed Bank of Latvia governor Ilmārs Rimšēvičs to return to work, the bank’s council decided to hide from him information related to the case, TV3 programme Nekā Personīga. The bank’s council decided to isolate the governor from information related to prosecutor’s questions and the answers provided. Additionally, he has no access to information about three banks – ABLV, Trasta komercbanka and PNB. This is because all of them are associated with Rimšēvičs’ criminal processes, as reported by the programme. The Bank of Latvia has created internal information exchange procedures to provide guidelines for employees in situations when Rimšēvičs could attempt to influence witnesses. Prosecutor Viorika Jirgena does not believe he could attempt to hide evidence or influence witnesses in the central bank. The governor of the Bank of Latvia is also automatically a member of the council of the European Central Bank. ECB is proud that it defends its independence. European Commission and the board of ECB are interested in discussing the prohibition for Rimšēvičs to work in the bank with Latvian ministers and the prime minister. There are some ECB council members who are involved in criminal cases in their countries. However, none of them have been applied with any restrictions to perform their duties. What is particularly interesting is that the governor of Slovenia’s central bank has stepped down when a criminal case was launched against him, the programme reports. The court agreed in Rimšēvičs’ case that the prohibition for him to perform his duties is equal to his dismissal. While Latvia’s laws permit this, if the guilt of the governor is proved, dismissal of members of the European Central Bank provides wider opportunities – even if there are justified suspicions of serious crimes. However, Latvia has not provided proof of Rimšēvičs’ guilt. Latvia’s Justice Ministry denies mistakes being made in the investigation. The aforementioned ruling has far-reaching consequences for Rimšēvičs’ case. If a member state establishes a prohibition of an official of an EU institution to take post, law enforcement institutions can be asked to provide evidence to the European Union Court of Justice. «Our position is rather strict – we cannot disclose evidence and thereby undermine the investigation. Latvia’s court plays the most important role,» the now ex-Prime Minister Māris Kučinskis comments. The court process of the European court was held in September. At the time, interrogations had only commenced in Rimšēvičs’ criminal case in Latvia. Before then, Rimšēvičs used his right to not testify. European court requested Latvia to provide evidence within eight days to back Rimšēvičs’ guilt. «If a discussion appeared in regards to documents, I asked a question if those documents would be sent to someone else. The court’s answer was – yes. This means the principle of confidentiality would not be applied there,» said Jirgena. The fact that evidence would be provided to the other side is proved by minutes of the court hearing. Latvia submitted 44 documents. Among those documents was the correspondence between KNAB, Bank of Latvia, ECB and German institutions about Rimšēvič and decisions related to Trasta komercbanka. Additionally, documents associated with investigative procedures were submitted, including KNAB’s decision to make Rimšēvičs a suspect. This document mentions audio recordings of telephone conversations, testimonies, confiscated items and reports, none of which were provided to the European court by Latvia. In December, a detailed opinion was published by the attorney general of the European Union Court of Justice. In it, she said Latvia has suspended a member of the council of ECB and has refused to provide evidence of this guilt even though all topics associated with ECB are in the competence of the European Union Court of Justice. Because Rimšēvičs has begun testifying, Latvia believes there is a risk of undermining the criminal case. This is why measures have been taken to prevent the case from falling apart. «The prosecutor proposed telling European Court of Justice that she is prepared to provide all materials of the case, but only if she receives guarantees from the court that these documents will not be provided to the other side,» says Kucina. At the time, the criminal process consisted of 23 volumes. Latvia sent two letters to the European court, offering to submit documents. European Court of Justice did not provide an answer to Latvia’s proposal, because the verbal portion of the court process had concluded by then. What is particularly surprising in the ruling is that the European Court of Justice did not ask Latvia to act. Instead the court simply overturned one of the security measures imposed against Rimšēvičs, as reported by Nekā Personīga. Rimšēvics’ lawyer Mārtiņš Kveps reminds that European Court of Justice had asked Latvia to amend Rimšēvičs’ security measure as early as summer 2018. This was done so that he would be able to authorize his deputy to work in the council of the European Central Bank. Latvia’s compliance with this request was slow, he says. Other involved in the process allows that Latvia’s refusal to provide evidence could be interpreted as disrespect of their court system, says Nekā Personīga. Currently there is nothing preventing law enforcement institutions from imposing the same security measure against Rimšēvičs. But in this case they would have to keep in mind that confidentiality of investigations does not apply to the dismissal of ECB officials, because confidentiality is not even mentioned in the court ruling, comments Nekā Personīga. Rimšēvičs’ term ends at the end of this year. Rimšēvičs has not had access to official secrets since summer 2018. Ever since then, this has been a subject for Saeima’s vote on his dismissal. «The governor of the Bank of Latvia does not require access to official secrets to perform his duties and stay in his posts in Latvia and Eurozone,» comments Bank of Latvia press-secretary Jānis Silakalns.